"I contacted TDN because of a ring design I had seen on the website, but I needed a few changes and a complimentary necklace. Trang Dai worked with me on options and then created the pieces and they were perfect. In the end I had to guess the ring size and was wrong and Trang Dai fixed it very fast and perfectly. I highly recommend TDN for anyone looking for custom jewelry"
"I contacted Trang Dai TDN because of a ring design I had seen on her website while browsing through Pinterest. I was looking for an engagement ring with a celtic theme as we live in Ireland. Trang Dai worked with me on options until we got the one I thought suited most. As I didn’t have my girlfriends finger size we did a guesstimate which was slightly bigger than needed. When I finally popped the question and life was good!, I sent the ring back to Trang Dai who resized it for me. From start to finish Trang Dai was very easy to work with. I would highly recommend TDN for anyone looking for custom jewellery. I have passed her name on to others here in Ireland, I hope she gets more business from it." "Good morning Trang Dai, I just wanted to thank you for the rings! We bought the nautical engagement ring just over a year ago and purchased this ring as a wedding band! 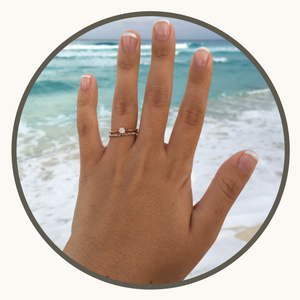 I love both rings so much and appreciate your hard work and excellent customer service!" "I was looking for engagement rings online, and found that most of the big box jewelry dealers all had different versions of the same things at ridiculous prices. Then I stumbled upon TDN Creations' website and immediately fell in love with her unique style. I REALLY liked her love knot designs, and contacted her to come up with a different variation centered around a diamond. Trang Dai worked patiently with me over the course of many weeks, creating prototypes and incorporating my feedback until we settled on the perfect design for my fiancé. I cannot begin to express the gratitude I have for the symbolic ring Trang Dai created for us, and most importantly, her selfless efforts and willingness to continually adapt her creation to my liking. This ring means so much to us and will be treasured for generations in our family. Trang Dai helped make our dreams come true! P.S. The picture I attached does not do this ring justice. Sometimes we can't help but stop what we are doing and admire it when the light catches it just right :)"
I wanted to touch base with you about the double figure-8 engagement ring I recently purchased from you. I think I told you, we were to head out on a road trip to Oregon to catch the eclipse. Well, we ended up in Idaho instead, which worked quite well overall. After the eclipse had concluded, we got on the road for the long drive back to Maryland. Our goal (and my personal goal) was to get to the Tetons in Wyoming that evening. With some side trips along the way, we arrived that night under clear skies (when we were in the Tetons a week before we had clouds and rain - but Michelle still loved the area). We set up our camp, then Michelle decided to take a few minutes to look at the night sky, where she saw two meteors. With the Milky Way coursing overhead, the dark silhuoette of the Teton mountains not even ten miles to our west, I proposed and she accepted. 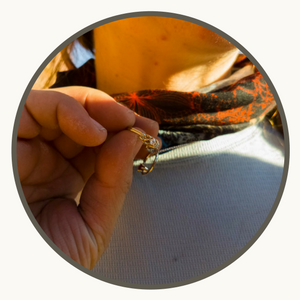 She was very happy to *not* have a diamond on the ring (she'd been married once before, been there and done that), and the simple double figure-8, given that we are both climbers, meant far far far far more to her than if a diamond had been on it. (this way it is unobscured). Thanks so much for making these style rings!" "My fiance ordered the ring sometime in the last month and I received it yesterday. I just wanted to tell you that it is absolutely BEAUTIFUL and EVERYTHING we wanted!!! "OH MY WORD, TRANG!!! THIS IS FABULOUS! We are climbers and this knot means so much. It has saved us as we have pushed each other to climb harder and fall further over the years. Every week, multiple times, we double check each other's knots to make sure it's done right. These partner checks have saved our lives. This ring signifies a lot for us. The sport we love, given to me by the person who I share my climbs and my life with. You are incredible. Thank you so much. Vera"
Thank you so much for the beautiful ring. It is absolutely perfect and my expectations were far exceeded. Your work is absolutely amazing! "I just wanted to write you about how pleased I am with my ring! 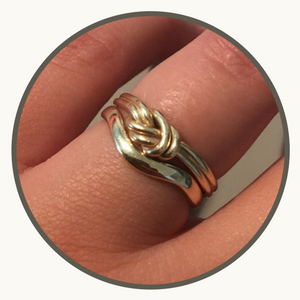 I decided on this ring because of a verse from the book of the Bible in Ecclesiastes that I wanted to make a representation as part of my marriage "a cord of three strands is not easily broken". This ring means so much to me. It represents my husband and I twisted together with our Lord and Saviour and the three of us are able to create a beautiful and healthy marriage. Thank you for such a precious design, great quality, and fantastic service. I couldn't be more pleased.